Was she risking more than she would win in the game of life? 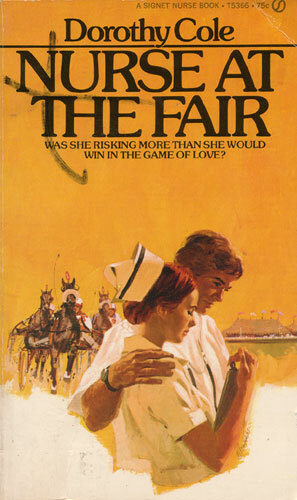 Pretty, auburn-haired Merilee Maxwell was happy in her position as nurse and in her love for tall, red-haired Dr. Kendall Ryder to whom she was secretly engaged. But suddenly the serenity of her world was threatened when TV-Western star Tex Howard was admitted to the hospital after being injured in a mysterious accident. Tex was dangerously attractive, and the way he set about working his charm on Merilee was enough to turn any girl’s head. It wasn’t until she was caught in an explosive incident at the local fair that Merilee realized just how dangerous was her relationship with the handsome singing cowboy. She had followed her heart and it had led her into trouble. Had she gone too far to turn back…?